Let’s roll the clock back to 1993. Bill Clinton was in the Oval Office, Nirvana was on the radio, and the first Nissan Altima was rolling off the assembly line in Tennessee. Twenty-five years ago, Nissan was mainly concerned with outselling its rivals’ sedans, but in 2018 it has bigger problems. Crossovers are eating into sales of midsize sedans like the Altima. With the redesigned 2019 model, Nissan sought to make a case not just for the Altima, but for the sedan itself. At the same time, the Altima fights for sales in one of the auto industry’s most competitive segments. The midsize sedan segment is dominated by the Honda Accord and Toyota Camry but it features a number of smaller fish like the Chevrolet Malibu, Hyundai Sonata/Kia Optima twins, Mazda6, and Subaru Legacy, as well as the aging Ford Fusion and Volkswagen Passat. Nissan invited Digital Trends to Santa Barbara, California, to sample its latest contender. The 2019 Altima is available in S, SR, SV, SL, and Platinum trim levels, with standard Apple CarPlay and Android Auto compatibility across the board, starting at $23,750. Front-wheel drive is standard but, for the first time on an Altima, all-wheel drive is available as an option. We grabbed one of 3,900 Edition One models, which get special trim pieces and three years of complimentary concierge service for $35,750. The previous-generation Altima was a comparatively weak effort, but it was clear upon opening the driver’s door that the 2019 model was a major improvement. While the interior is still a bit subdued, everything is sensibly laid out and, aside from some grained plastic trim doing a bad impression of wood, materials feel high quality. Unlike many modern cars, the dashboard sits fairly low, giving a sense of airiness to the cabin. Nissan also kept the NASA-inspired Zero Gravity seats from the previous-generation Altima, which were designed based on the space agency’s research on human bodies. They felt both supportive and comfortable, with plenty of cushioning, but not so much that we sank into them. The Altima offers slightly less overall passenger and trunk space than most competitors. Another area of big improvement is infotainment. When the previous-generation Altima was launched as a 2013 model, a 5.0-inch display screen was considered satisfactory. That isn’t the case today, so the 2019 Altima gets a standard 8.0-inch display screen sticking out of the top of the dashboard, as well as a 7.0-inch instrument-cluster display and four USB ports: A Type-A and Type-C for both the front and rear. The infotainment system isn’t the most elaborate one around, but it covers the bases. The infotainment system isn’t the most elaborate one around, but it covers the bases with a responsive touchscreen and clean, intuitive graphics. Nissan also offers three years of complimentary map (for navigation-equipped cars) and head unit software updates, as well as Amazon Alexa and Google Assistant connectivity. Owners who subscribe to Nissan’s telematics services can get real-time traffic information from SiriusXM, and a door-to-door navigation feature that interfaces with the driver’s smartphone. Our test car was one of 3,900 Edition One models that will kick off 2019 Altima production. The special editions come with three years of complimentary concierge service, allowing drivers to speak to a live person who can do things like reserve concert tickets, or find the nearest Starbucks and beam directions to the car’s navigation system. This is a feature normally seen only on luxury cars, so it’s unusual to find it on a mainstream midsize sedan like the Altima. While we did have trouble connecting to the call center (something a Nissan representative attributed to our test car’s pre-production head unit and spotty cell reception on the drive route) the person we eventually talked to was friendly and courteous. But since the service will only be available on a limited number of cars, it’s not really relevant to the average buyer. The 2019 Altima is also the latest model to get Nissan’s ProPilot Assist driver-assist system. ProPilot Assist combines adaptive cruise control with steering assist to keep the car centered in its lane, but drivers must keep their hands on the wheel at all times. We previously experienced the system in the Nissan Leaf, and this second impression didn’t change our opinion. Nissan sought to make a case not just for the Altima, but for the sedan itself. ProPilot Assist works fine within the parameters Nissan has set (the lane-centering function is much better than systems we’ve seen in more expensive cars), but those parameters are very limited. The system needs highways with clearly marked lanes and weather conditions that allow the onboard cameras to see those lanes. If all of those conditions are met, the driver is still left holding the wheel even as the car steers. At that point, we feel we might as well do the steering ourselves. The 2019 Altima also gets Safety Shield 360 on the SV and higher trim levels. Safety Shield 360 is Nissan’s answer to driver-assist tech bundles offered by Ford and Toyota, combining forward and rear autonomous emergency braking, high beam assist, lane departure warning, blind spot monitoring, and rear cross traffic alert. A driver-attention monitor is standard as well. Navigation-equipped models get traffic sign recognition. The 2019 Altima gets two new engines as part of its redesign. 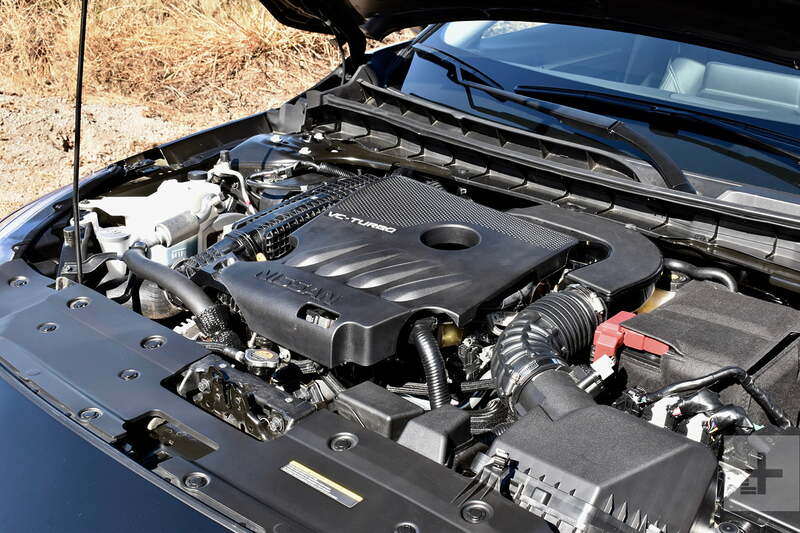 The standard engine is a 2.5-liter four-cylinder making 188 horsepower and 180 pound-feet of torque. That’s competitive with the base engines of other midsize sedans. Front-wheel drive is standard, but Nissan is also offering an optional ($1,350) all-wheel drive system derived from the Murano and Rogue. A first for the Altima, it should help the sedan in its crossover-fighting mission. The only other midsize sedans available with all-wheel drive are the Ford Fusion and Subaru Legacy (it’s standard on the Subaru). Buyers can also opt for the 2.0-liter VC-Turbo four-cylinder previously seen on the QX50 crossover from Nissan’s Infiniti luxury brand. The “VC” stands for “variable compression,” signifying the engine’s ability to change its compression ratio on the fly to emphasize either fuel efficiency or power. Many companies – including Saab – have tested the technology before but Nissan is the first to figure out how to bring it to series production. Nissan claims the VC-Turbo, which is front-wheel drive only, offers power comparable to V6 engines like the one offered in the previous-generation Altima with four-cylinder fuel economy. 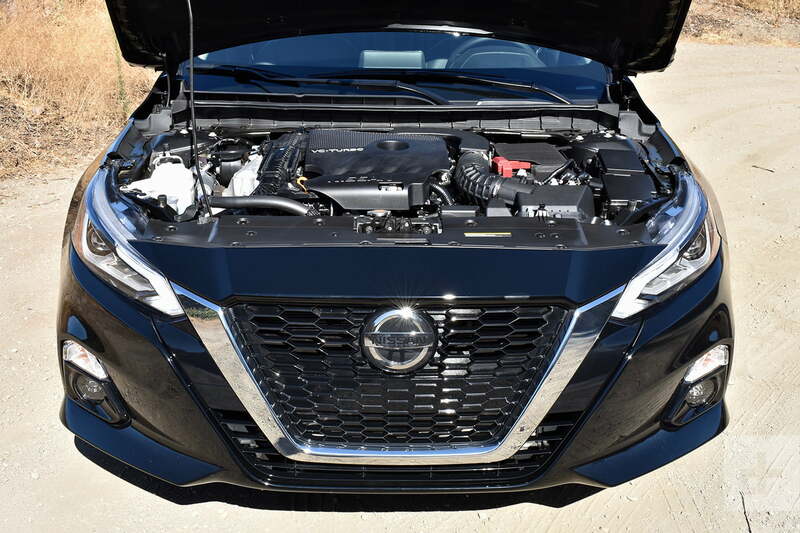 In the 2019 Altima, the VC-Turbo produces 248 hp and 280 lb-ft, compared to the 270 hp and 251 lb-ft of the 2018 Altima’s naturally aspirated 3.5-liter V6. It is a close match for the 2.0-liter turbo four-cylinders offered in the Honda Accord (252 hp, 273 lb-ft) and Hyundai Sonata/Kia Optima (245 hp, 260 lb-ft). The Toyota Camry is still available with a 3.5-liter V6 producing 301 hp and 267 lb-ft, Subaru offers a 3.6-liter boxer-six in the Legacy with 256 hp and 247 lb-ft, and the Ford Fusion V6 Sport’s 2.7-liter turbocharged engine boasts 325 hp and 380 lb-ft. The Altima rides comfortably and isn’t a liability in traffic, but it doesn’t offer anything exciting, or even memorable. On the road, the VC-Turbo feels like any other turbocharged four-cylinder engine, which is quite an achievement considering its variable-compression party trick. The engine is smooth, responsive, and delivers power in a linear fashion. Both the VC-Turbo and the base 2.5-liter four-cylinder are shackled to a continuously variable transmission, but this one at least behaves better than most. Overall, the driving experience is completely unremarkable. The Altima rides comfortably and isn’t a liability in traffic, but it doesn’t offer anything exciting or even memorable. The VC-Turbo is almost too well mannered for its own good, the electric power steering is so lifeless it feels like the wheel isn’t connected to anything, and the suspension isn’t up to the task of corner carving. Nissan predicts the 2.5-liter engine will return 32 mpg combined (28 mpg city, 39 mpg highway) with front-wheel drive, and 30 mpg combined (26 mpg city, 36 mpg highway) with all-wheel drive. The VC-Turbo engine is expected to get 29 mpg combined (25 mpg city, 34 mpg highway) in its sole front-wheel drive configuration. Both sets of figures are near the top of the midsize-sedan class, but the Chevrolet Malibu, Ford Fusion, Honda Accord, Hyundai Sonata, Kia Optima, and Toyota Camry are all available with hybrid powertrains as well. Nissan offers a three-year, 36,000-mile basic warranty, and a five-year, 60,000-mile powertrain warranty. Because the Altima was completely redesigned for the 2019 model year, it is difficult to predict reliability. Nissan has a fairly good overall reputation for reliability, however. Instead of grabbing one of the 3,900 Edition One models like our test car, we’d go for the Altima Platinum. The exclusivity of the Edition One is cool, but the only substantial difference between it and the Platinum are some trim elements and the concierge service, which we don’t see ourselves using enough to be worthwhile. The Platinum includes the full array of tech features available on the Altima, including the Safety Shield 360 bundle, and is available with the VC-Turbo engine. Speaking of the VC-Turbo engine, we can see reasonable arguments for both it and the base engine. We definitely appreciated the VC-Turbo’s power, and that would make the decision for us if we lived in a region with mild winters. But if you live in, say, the Northeast, the base engine and its available all-wheel drive make sense. It all depends on what your needs are. Our ideal Altima would have all-wheel drive and the VC-Turbo engine but that car doesn’t exist, and Nissan probably wouldn’t sell many if it did. 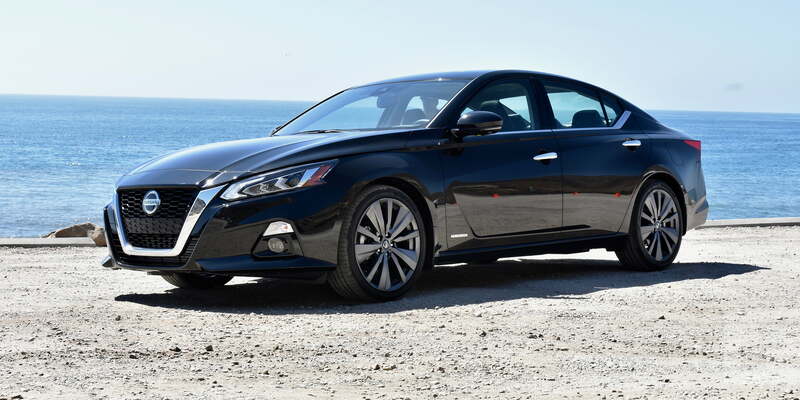 The 2019 Nissan Altima is a big improvement over its predecessor, but that isn’t enough. We’d take this low-slung sedan over a pudgy crossover, but we’d say the same of a number of other midsize sedans. The Altima doesn’t do enough to distinguish itself from its myriad competitors.